Stand Up Inside. Packs to 21" x 10" and Weighs 14 pounds. Free Shipping On Tents in the Continental US. 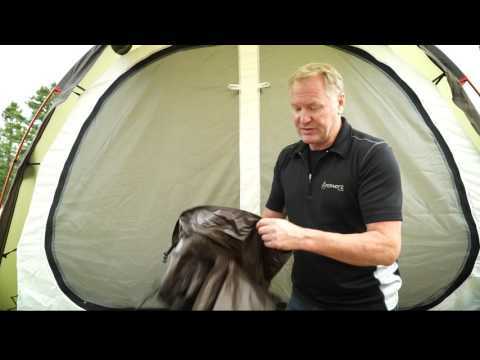 The Atacama is the third generation of our original, patented motorcycle tent. 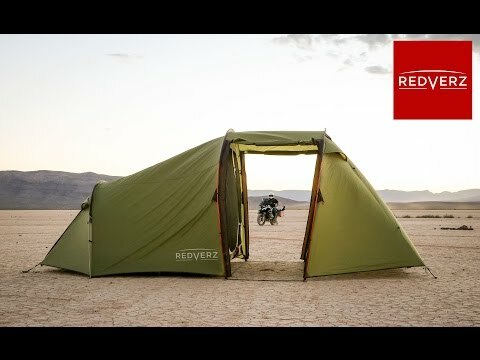 The unique garage design birthed an entirely new tent genre back in 2008, a class of tents which had motorcyclists and their bikes clearly in mind. Others have attempted to copy the design, but we stay out front and constantly push the boundaries of luxury and functionality, designing gear that meets the needs and wants of our customers. 2 Up? A queen size bed with ample space either side for your gear and your own unique entry/exit door. Complete your Atacama set up with custom fit groundsheets for the sleep area and garage or a 50 liter dry bag to stow it all away. 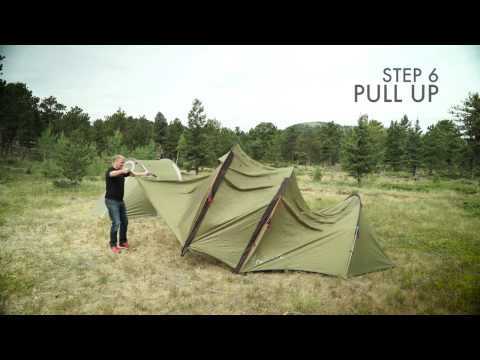 Tent comes complete with guy lines and tighteners with stow bags, stakes, stake bag, poles, pole bag and an easy-to-use compression stuff sack. What a fantastic tent this is. So easy to erect and take down and the amount of room inside is amazing. I’m 6ft 1in and stood up in it to change and move around without having to duck or bend. The sleeping area is vast with 2 of us able to sleep in it with plenty of room to spare. We also kept all our kit in the sleeping compartment without it being cramped or us having to climb over bags etc. The vestibule is also very large so we just used it for sitting and relaxing in when it was raining outside. We did put the bike (Harley-Davidson Road King) in for a couple of night and still had plenty of room to move about and sit around. I highly recommend purchasing the ground sheets as they give you a better surface to walk around on when not wearing boots. They also give you the protection form any ground dampness. They are so easy to fit, just clip them to the tent corners and that’s it done. As for the size, again they are very small with no weight in them at all. I ordered this as a last resort from TwistMoto due to another supplier letting us down at the last moment but I just wish I had spoken to them first. The service and advice was excellent (thank you Andy) and it was delivered the next day. I general this is a great tent and worth every penny. What made it better for me was the service received from TwistMoto.